I’m Geoff Robson, DIO’s Chief Operating Officer. As you will probably have heard or seen, Portsmouth welcomed the first of the Royal Navy’s new aircraft carriers, HMS Queen Elizabeth, into port for the first time on Wednesday 16 August 2017 and I was lucky enough to be in attendance. If you’re a regular reader of this blog, you will also know that DIO has played a vital role in making this happen. 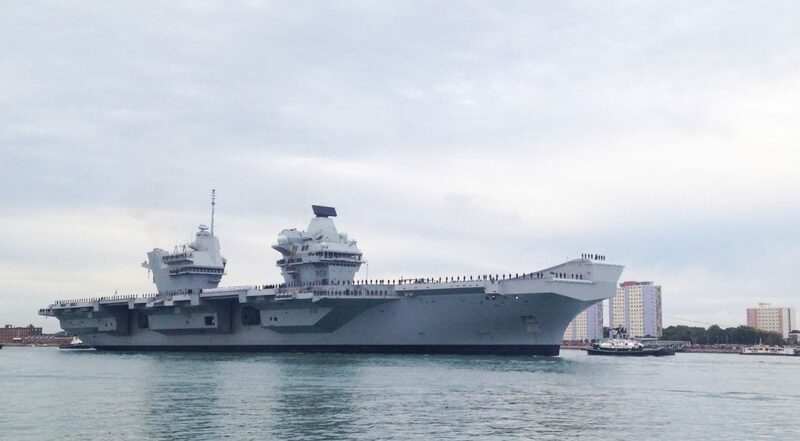 Without the infrastructure improvements we’ve made, Her Majesty’s Naval Base (HMNB) Portsmouth would not be able to take the new carriers as they are so much bigger than any previous Royal Navy vessel. DIO exists to allow the military to safely live, work, train and deploy. 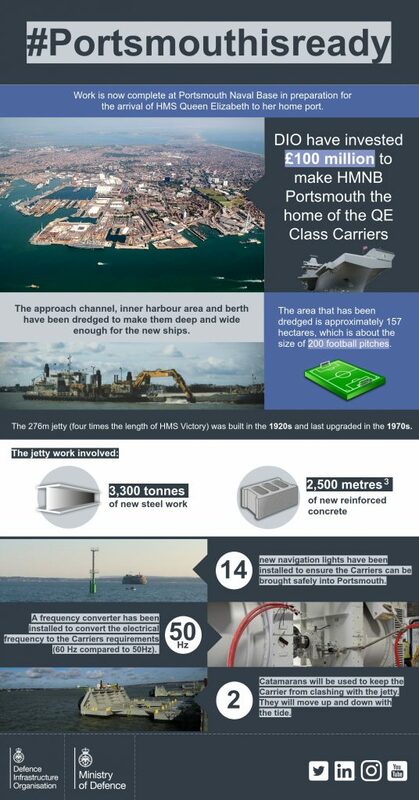 The work on HMNB Portsmouth has been one of our most important projects. 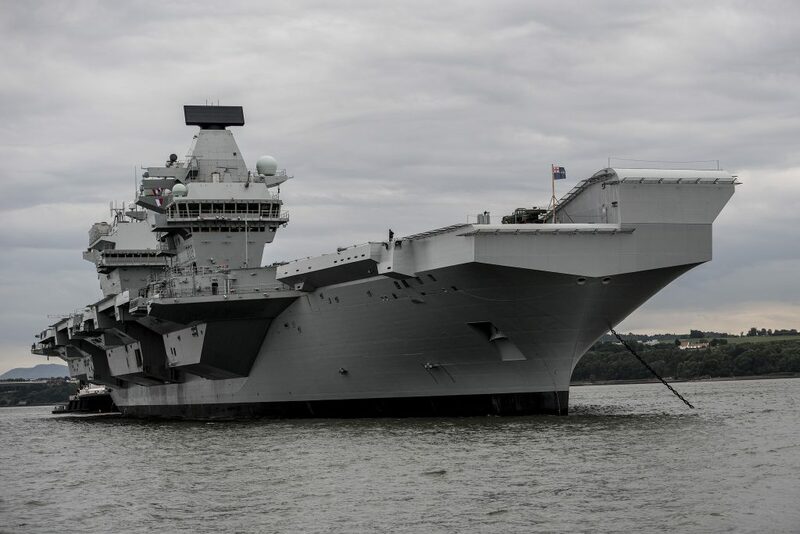 Although not one of our larger projects in terms of cost, it’s been crucial and multi-faceted which includes the provision of 2 new jetties and a massive dredging operation to accommodate the size of the new Queen Elizabeth Carrier. You may have seen in the news a couple of weeks ago about all of the archaeology found when our contractors Boskalis Westminster were dredging the harbour and approach channel. They removed about 3,200,000m3 of material from the sea bed and in doing so, found a number of interesting items, including anchors, cannons, crockery and even a human skull! More than 20,000 items were found and as well as those mentioned above, a significant amount of ordnance was found. Much of this dated from the Second World War, when the city was a target of German bombing, but some was much older. Some of this, like the cannonballs were not dangerous but others were, so we had to work closely with our colleagues in the Royal Navy’s explosive ordnance disposal teams. We also upgraded the jetty to make it strong enough to take a ship the size of HMS Queen Elizabeth. The original 1920s sections were replaced and the 1970s sections were reinforced. Middle Slip Jetty was officially named the Princess Royal Jetty in March this year, by the Princess Royal herself. 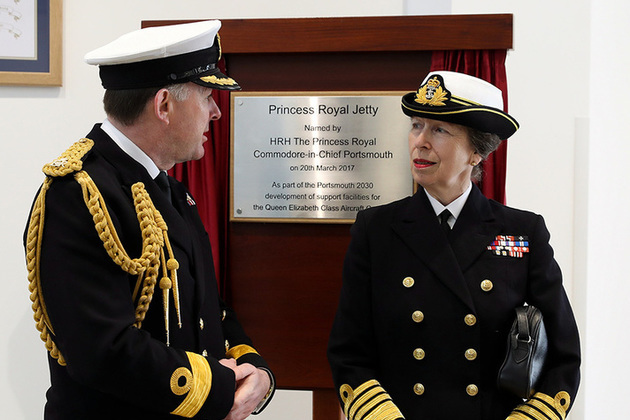 Her Royal Highness The Princess Royal with Portsmouth Naval Base Commander Commodore Jeremy Rigby at the official naming ceremony of the new Jetty, The Princess Royal Jetty. As you can see from the video link below we invited a Second World War veteran to see the work. Les Wills served on HMS Indefatigable during the war and Portsmouth was his home port. He hadn’t been back in decades and was thrilled to be invited to see the progress. On the side of the jetty is a new electrical frequency converter. 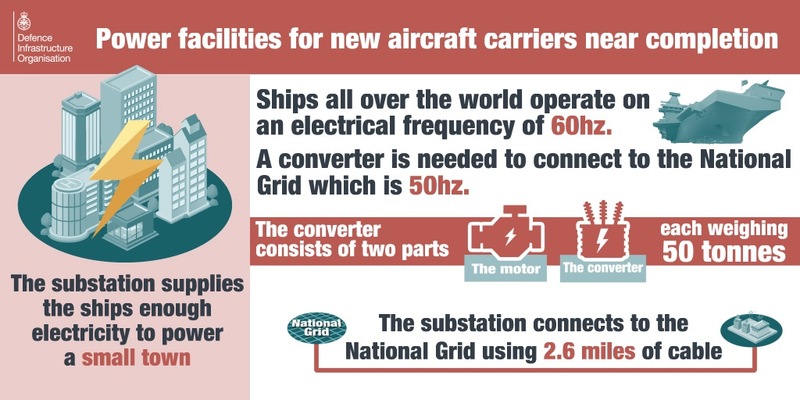 Vessels across the world operate on a frequency of 60Hz, but the UK National Grid is at 50Hz so before the electricity can be supplied to the ship, it has to be converted. The power comes to the frequency converter via 2.6 miles of cables we installed between Old Portsmouth and the jetty. With our contractors VolkerStevin, we built an electrical substation on the jetty for the frequency converter. Finally, we installed navigational aids – special lights to help the ship’s navigator find the correct approach channel. That’s essential as they need to approach the harbour along the section of the sea bed which has been dredged to be deep enough. There are 14 separate structures which rise up to 30 metres from the sea bed. 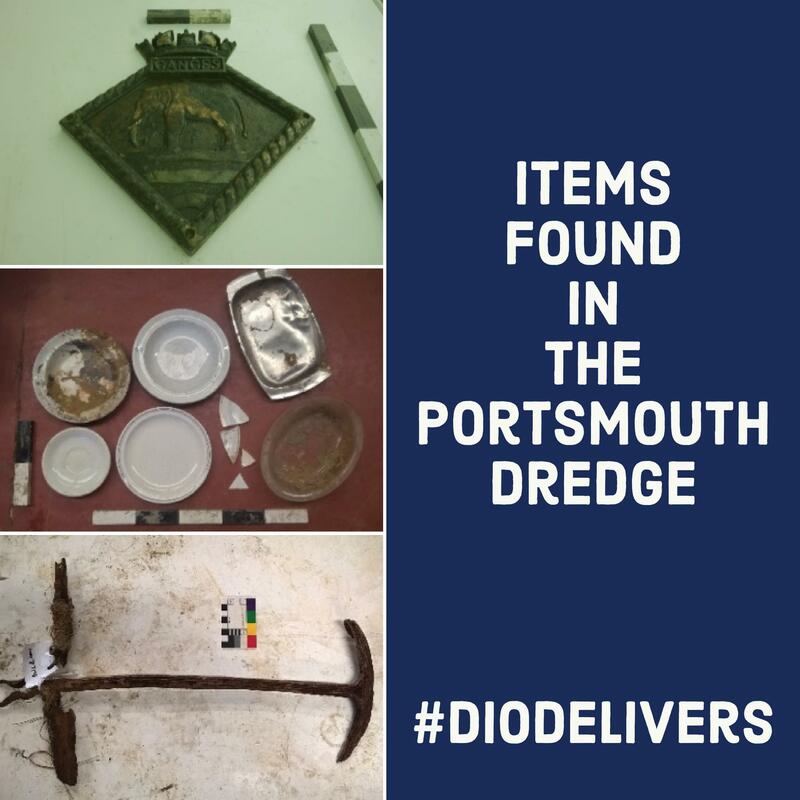 As you can see, it’s been an enormous task and I’m really proud of the DIO team who have worked in collaboration with industry partners and others including the Royal Navy and the Queen’s Harbourmaster, to make it a success. 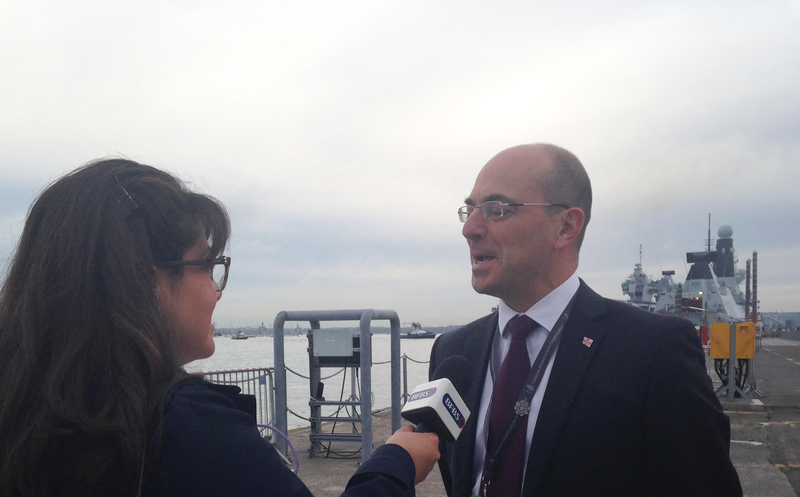 I watched HMS Queen Elizabeth’s arrival this morning with the satisfaction of a job well done.